Fast forward 11 years or so and I thought I’d be the last person considering a marathon. While my physical fitness had drastically improved, and at some point my dream of becoming a healthy weighing adult became a reality, still, running was reserved for “real” athletes. I would ooh and ahh when my friends described their running accomplishments, marveling at their seemingly inhuman fitness and ability to run 45 minutes without stopping. I would drive along the beach in the town where I live and cringe at the suicidal maniacs who dared to make their way up Oxford Street, a climb that would put most San Francisco streets to shame, or Marine Drive, perhaps a slightly less steep climb but about 5 times as long as Oxford! Then one day, like every other endeavor I tackled in my life, including my law degree, my musings turned into “I wonder if I could do that?” I sought advice from a few friends, Googled, and then finally one cold December evening I set out on my very first run, garbed in a pair of ancient shoes that looked like sneakers, but were more of a fashion statement, my yoga outfit, and a watch. I had no idea what I was in for except that I knew I had to start slow. My first 20 minute run consisted of a succession of 3 minutes of running, followed by 2 minutes of walking. I didn’t experience the memorable flutter of childhood panic after being told, “Ok everyone, hit the track for a 5 minute warm-up!” What I got instead was the familiar acrid taste of blood in my mouth, and that awful breathing–the loud, rapid, painful breathing that made me wonder if I overdid it. This time, I had chosen not to listen to music, having learned, through various other physical activities I pursued over the years, to become familiar with my breath instead of drowning it out. Still, the breathing was driving me crazy, as was the taste. “How on earth am I ever going to run for 45 minutes,” I asked myself, “if I can hardly run 3?” Since my motivation to start was merely to see if I COULD do it, I persisted. 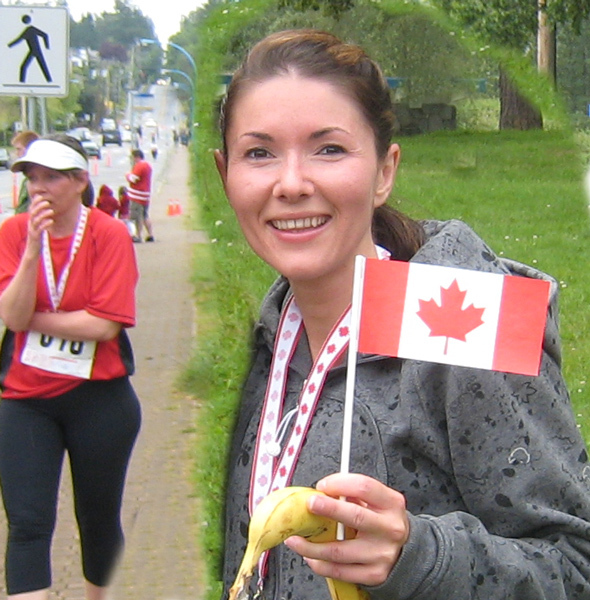 And two weeks later, with my friend’s encouraging words of “Of course you could do a 10K!” I ran my very first race on Canada Day. My goal for that day was merely to just “do it”, but as I crossed the finish line, my friend pointed to the clock and yelled, “UNDER AN HOUR! YOU CAME IN UNDER AN HOUR!” and I repeated to myself again, “Enjoy this moment because there is only one ‘first time’ for everything.” Followed by, “I DID IT! I DID IT!” My eyes brimmed with tears, touched by the support of my fiancé and friend, and the many spectators who came to support me and everyone else. It felt wonderful to be believed in. I felt as if I could climb any mountain, I could do anything, because I had achieved the seemingly impossible feat of running 10 kilometers. I had it in me all along. I savored that special moment and then, as my heart rate returned to normal, I marveled: If I could go from a chubby child who hated running, to a young woman hardly able to run 3 minutes, and now I had just accomplished an hour run–what else was I capable of? Could I go up Oxford Street, or Marine Drive? Could I do a half-marathon, or a full-marathon? There was only one way to find out. Although running is typically not a team activity, it isn’t entirely solitary either. I’ve been able to rope in a few friends here and there, including a wonderful, steady running buddy who is my future sister-in-law. Together we have seen each other through minor injuries, days where we felt like walking or throwing-up following a particularly arduous hill climb, and the occasional bouts of laziness. We’ve also seen each other through 3 days of running, then to 4 and 5, and nearly 30 kilometers of running per week. Ten kilometers is becoming a regular run for us. In fact, we conquered Marine Drive together and will begin working on Oxford Street soon as we work our way up to our first half-marathon. While she and I run together, the rest of our family runs with us in spirit. After, we regale them with stories of our conquests and the lessons we learned along the way. Such as the fact that running seems to be a big metaphor for life and for little clichés like: start slow, be consistent, give yourself a break when needed, be kind to yourself, push yourself, don’t give up. These mantras have been on my mind at one point or another throughout a run. Other revelations are less obvious or cliché. Those are the ones that expand my horizons, that challenge me to open my mind to new experiences and different ways of thinking about and seeing the world. Running, similar to meditation, has helped me become a better person because while running can become a habit, it can also help break habits. After all, 45 minutes is a long time to contemplate your life, to focus on your breath, and to pick one affirmation to work on during a particular run, and then repeat it to yourself over and over again. Whether it’s the challenge of putting my shoes on and getting out the door, tackling a steeper hill, a longer course, or overcoming fatigue, running has helped me realize that each challenge is possible to overcome. And although that first step is all up to me, once I do it, I know anything is possible. My running buddy may be facing a different challenge that day, and I can share the experience and inspire others. If you’ve ever had the thought in your mind, “Could I do that?” the answer is ALWAYS “Yes!” The key is to just “do it.” Enjoy the moment, because while there is only one “first time” for everything, everything encompasses an endless array of possibilities. There’s really only ONE main resource I used which was Runner’s World . If you wish to actually talk to someone nice and get advice or training then The Running Room offers not only shoes, clothes but also courses on running called “Running Clinics” as well as books and running journals.